For those with access to the Invoices section, an Invoice Summary report can be created. A list of companies is displayed for an overview of time and expenses recorded in reference to those companies. The report initially display filtered on the current quarter. 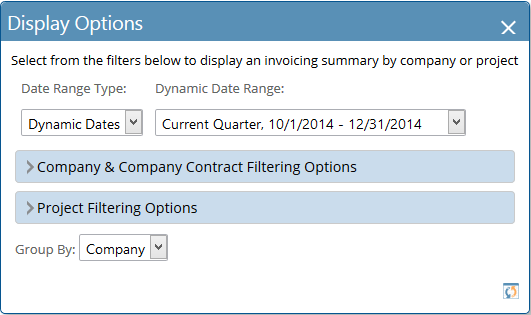 You can easily change the date range and filters in order to create a report with all or only certain invoices. Setting dates allows for the selection of a "Date Range Type," the first of which is a "Dynamic Dates" selection. Selecting from the drop downs, specific companies and/or contacts may be selected to refine your report. Project Filtering Options can be set to filter based on Project Type, Project Status, Project name, Project Number and/or Resource Type. Selections available will vary from report to report. Group by allows you to group the invoices by either Company or Project. The summary presents time and expense entries into the following categories. 1. Invoiced - included on an existing invoice. 2. Approved - not yet invoiced, but approved and eligible for invoicing. 3. Pending Approval - submitted for approval, but not yet approved. 4. Unsubmitted - entered, but not submitted for approval. 5. Total - the total for all of the above categories.